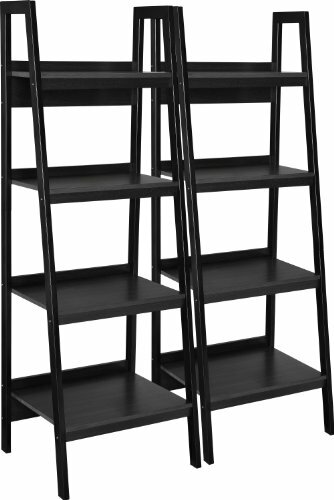 The Altra Lawrence 4 Shelf Ladder Bookcase scored high marks in every category and is our top pick. This stylish book shelf looks great in any room you put it and adds extra vertical space for collectibles, photos, books or anything else you want to put on it. The shelves vary in size so smaller items can be on the top and larger things on the bottom. Heavier items can be put on the bottom as well. The black finish and metal frame looks great with most decorating themes. Assembly is required. Most households will have at least one bookcase but due to the versatility and usefulness of them, you will find that most homes have several. Bookcases can be used for more than just books. They can be used in offices for file storage, children’s rooms for toys, and living rooms and dens for decorative items. They are easy to find and match any budget. To find the best bookcase for your home there are several things that you want to consider. The first item on the consideration list is determining what you need bookcases for and how many you need. With all of the choices available in size, style, configuration and price, it can be overwhelming to choose one for your home. We spent over 35 hours researching and testing 10 different kinds of bookcases and found that weight capacity per shelf, overall construction, and materials used were most important. This buyer’s guide will provide you with information on the different types of bookcases on the market and how to choose the right one for your specific needs. This knowledge will help you reduce the selection you are choosing from and will allow for personal preference as well. Bookcases can be very simple or unique and unusual in design. You have a lot of options available to ensure that you get exactly what you want. The stylish design of the Altra Lawrence 4 shelf Ladder Bookcase will look great in any room you want to place it. It adds vertical space for books, collectibles, photos or anything you want to put on it. You will get two ladder style bookcases in this set that can be placed side by side or in any number of other configurations. The shelves are varied in size so you can add smaller items on top and larger, heavier items on the bottom. They have a black finish that is sleek and stylish with a metal frame which goes well with most decorating themes. The shelves are durable and long lasting. There is assembly required. You have a lot of options with these two unique, attractive ladder bookcases. They are perfect for use as an entertainment center; just place one on either side of your television and fill them up with plants, books, and anything else you choose. This unique and convenient folding bookcase takes all the work out of assembling and makes it fun, easy and quick. It has four shelves that are capable of holding a whopping 150 pounds each and looks great in any room of the house. All it takes to set up this miraculous bookcase is to fold out the sides and flip down each shelf. That’s it! It’s ready to load with your favorite books, toys, collectibles, office supplies, electronics, food and more. Whatever you need a bookcase for, Stony-Edge Folding bookcase will be perfect. You can choose from a natural wood finish or dark espresso. The spindle sides add a decorative element that will enhance any room. This unique bookcase makes a fantastic gift and is perfect for college dorms, children’s rooms, kitchens, bathrooms and more. Create more storage space with this tall, narrow bookcase has 3 adjustable shelves and 2 fixed ones that can support as much as 30 pounds on each shelf. It measures 19”w x 11 ½”d x 71 ¼”h. This cherry finish bookcase has a sleek, contemporary design that looks great in any room you want to place it. It has been manufactured from laminate particle panels that are certified environmentally preferred. This 5 shelf bookcase is perfect for a number of uses. You can place books, decorative items, photo frames, plants, office supplies and much more on the shelves and add a lot of vertical storage to any room. You have a choice of Royal Cherry, Pure White, Chocolate or Pure Black finishes so the shelves will fit in any room in your house. This stylish and elegant bookcase comes with a 5 year limited warranty and is made in Mexico. Two adults are needed for assembly and tools are not included but full directions are so you can easily put this attractive shelf together. With all of the different bookcases on the market how do you know which is the right one for your needs? It can be difficult to choose with so many different styles, finishes and sizes available. The three top rated bookcases we have reviewed above are excellent examples of unique, sturdy bookcases that add to the storage in your home in an elegant and convenient way. Any one of these top choices are perfect for your books, folders, decorative items, toys, clothing and anything else you can think of using it to store. If none of the choices we have featured above strike your fancy, read the buyer’s guide below. The information in this guide will help you learn about the different types of bookcases on the market, the differences between them and how to choose the one that will be perfect for your needs. People use bookcases for a number of reasons including adding more storage to a room or adding decorative elements that are functional as well. There are dozens of options available to choose from. We have listed some of the more common styles of bookcases below along with their characteristics. Standard Bookcase – These workhorses are usually made of MDF or wood and have a closed back frame so nothing can fall off the back. They also have adjustable shelving or shelves that are evenly spaced and fixed. Ladder Bookcase – These bookcases are unique in design and are made to lean against the wall. They have “step” style shelves that are largest on the bottom and get smaller as you move toward the top of the unit. Corner Bookcase – These shelves make great use of corners. They are built at a right angle. Etagere’ – This type of shelf is more delicate than standard bookcases. The back is open and in many cases it will have glass shelves. It is often used for displaying collectibles and other items you want to feature. Cube Bookcase – cube bookcases can have divisions vertically or horizontally. This creates a cubby-like design that is perfect for using as storage baskets, toy shelves and garage organization. Many people will place wicker baskets inside the cubes for a different kind of pulled together look for the kids’ rooms or bathroom. Scaffold Bookcase – This type of bookcase looks just like its name indicates. It has two ladder like side supports with shelving in between. The size of the bookcase you choose is very important. This will determine how much space you get and how those shelves will look. The following points are what you need to consider when you are researching different bookcases. Bookcase Height – The majority of bookcases are going to be between 3 and 8 feet tall. The more expensive type of bookcase very tall and will fill up the space it is placed. Tall bookcases can be narrow and just take up a space about 2-3 feet wide or they can be much wider, 5 or 6 feet wide and take up a significant portion of the wall. Bookcase Width – Choose a bookcase where the width is relative to the height. If you prefer tall cases, get several that you can move around for different looks. If you prefer shorter bookcases, look for wider ones that are more substantial. Depth – The common depth of most bookcases is going to be 12”. This allows plenty of storage room on the shelves for your belongings. If it is ladder-style, the shelves will be narrower than a standard bookcase. Shelf Spacing – adjustable height shelves offer more flexibility for your belongings but if you know the spacing between fixed shelves you should be okay. Double check the space you have to work with before you choose your bookcases. You should measure the area where you want to put them to ensure that you don’t purchase a bookcase that doesn’t fit the space you have to work with. Some styles of bookcases include doors. This can be good for important books that you want to keep dust from building up or to protect important collectibles. The doors can be made of glass or made of wood. Wood doors do a better job of hiding items that you would prefer no one see. Bookcases are available in a variety of different materials. The most common ones are listed below. Particle Board – bookcases made from particle board or MDF are the more budget conscious choice. You shelves will have some weight restrictions so make sure you know what those are. MDF or particle board bookcases will not last as long as solid wood or metal choices. Metal Bookcase – Metal bookcases offer sturdy storage capability with a lot less bulk. It is a great look for those who like contemporary décor. Metal bookcases are available in a variety of finishes. Wood – Wooden bookcases are the most popular choices that offer many different designs and options. Wood is a great choice for standard bookcases since it can hold a lot of weight per shelf. The other benefit to wood is the variety of wood choices that are available, from pine to oak to maple. There are several tips that you can use to shop around for the perfect bookcase for your needs. We have listed these tips below so you will have a more enjoyable shopping experience. Where are you putting the bookcase? – Where you want to place the bookcase is very important. You will want to measure that space to ensure the bookcases you are considering will fit where you intend to put them. Measure height, width and depth of the spaces you want filled so you can compare that with the dimensions of the bookcases you like. How will you use it? – What are you going to be putting on your bookcase? Books? Toys? Tools? Do you need it for the office or living room? What you will be doing with the bookcase will play a part in the type of bookcase you choose. You will need to make sure that the shelve can handle the weight you need. Do you have a budget? – If you want to keep your cost down below a certain amount, you will be able to eliminate many choices based on your budget. You don’t have to choose the most important bookcases, but you definitely don’t want to buy cheap either. A well constructed wooden bookcase can last decades. Bookcases are very popular pieces of furniture that provide extra storage and visual appeal. They are used for anything from storing books to holding food in a pantry. With all of the different choices available it can be really tough to choose one style that you like and that’s it. The beauty of bookcases is that you can never really have too many. They are designed to create extra storage so you could technically add a different style to every room in the home and add storage and style to the whole house. Remember that you should determine what you need the bookcases for and how many you need before you start you research. Take a look at the three top rated bookcases we have featured above to see if any of those appeal to your preferences. They are attractive well designed, quality bookcases that provide a lot of style and storage. With the right information, you will not struggle to understand what you need to do to choose the perfect bookcase for your home. The hardest part will be deciding on the right style from so many unique and interesting options.